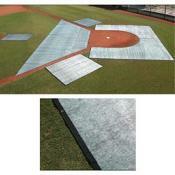 Two piece cage collar, Pro-Tech Turf blanket. Heavy-duty, extremely durable, 18 oz. breathable turf blankets will stand up to cleats to protect your turf. Comes hemmed and grommeted on edges. Anchor stakes not included, sold separately.